Remember 'viral' Facebook posts and 'pokes'? Things have changed a lot as Facebook has grown up. Campaign explores 15 ways in which the social media giant has changed and impacted the ad industry. These words could be true for 15-year-old Facebook too. Despite all the recent controversies around brand safety, political misinformation and data breaches, this is a company that has pioneered the new social media frontier. Indeed, it has created a service that has become so universally popular that lawmakers talk about regulating it as if it were a public utility. Facebook has, alongside Google, come to dominate the global online ad market and is the unrivalled social media organisation. But how has this new reality changed the lives of the people who work in advertising every day? And how much does Facebook appear to be maturing itself? Agencies of different flavours all report that social media has become a lot more central to client briefs and, as the biggest platform, there is no brief that does not include Facebook specifically. "There was a time when Facebook drove the entire conversation in content," VMLY&R London’s innovation head. Gracie Page, says. "'We want a viral Facebook post' was standard client request." Indeed, We Are Social, a 10-year-old digital agency, started life by feeding off a burgeoning demand for brands wanting organic social media. However, the conversation has moved to paid social when, about five years ago, We Are Social started finding it was becoming too difficult to reach people organically. The agency's chief strategy officer, Mobbie Nazir, says: "It shifted to a paid media approach – that changes how brands appear on the platform and has caused concerns around how we see transparency and safety and data. A lot of that shift has happened in the last couple of years." What is happening now, Nazir explains, is that people are posting less content on Facebook and engaging more with groups. Rather than Facebook needing to curate the news feed in order to serve people with more addictive content, it appears that greater numbers of people are seeking out their own comfortable spaces to communicate with others who are like-minded. 3 Data is the new oil, but who controls the well? In the last quarter of 2018, Facebook reported that it had more than 1.5 billion users visiting its platform every day – three years after it crossed the one billion milestone. With such reach comes a huge amount of data on users, many of whom are sharing intimate personal details about their life. But this means how the platform treats the data it has about its users, and how it controls access to this information, has become an issue that no media owner has had to face on this scale before. Emails leaked in December showed how, for example, Facebook was able to punish rival media companies and favour certain brands in terms of data access. Then there is the question of how easily Facebook's platforms can be abused, such as last year's Cambridge Analytica data scandal in which app developers were given access to users' information without sufficient consent. Cambridge Analytica developer Aleksandr Kogan and his company GSR were able to harvest Facebook user data of up to 87 million people without their knowledge. Facebook is not the only globalised company to suffer from data breaches, and its size and the personal nature of social media means it would be in the limelight no matter its policies. But, clearly, its policies towards data protection are under scrutiny like never before. In October 2018, Facebook began demanding that political advertisers verify their identity after a slew of reports of political misinformation being spread by paid-for messaging in the run-up to the 2016 Brexit referendum and the US presidential election later that year. This fell short of MPs' recommendations to have an opt-out for users who do not want to be included in customised lookalike audiences, where Facebook sells audiences to political campaigns based on people whose data profile is similar to their existing custom audience of known supporters. Facebook, meanwhile, cites independent research that shows its efforts to tackle the spread of fake news is working and, earlier this month, it announced that 500 pages and accounts linked to fake news from eastern Europe and Russia had been removed. The company says: "Three separate recent pieces of research from Hunt Alcott, Matthew Gentzkow, and Chuan Yu; University of Michigan; and the French newspaper Le Monde that using different methodologies and definitions of false news, all find that the overall volume of false news on Facebook is trending downward." Despite all the brand difficulties Facebook faced last year, the enthusiasm from marketers to use the platform did not change as might have been expected. Nazir explains: "Brands want to know whether people are still engaged on the platform and, because people are still engaging with Facebook, we’ve not seen a change in those client conversations." This anecdotal view is borne out by Facebook’s recent financial earnings – it has increased revenue per user to $7.37 for the fourth quarter of 2018 (up 19% year on year), while daily active users across the company’s brands are still growing in every geographic area (apart from North America). Facebook ads launched in November 2007, but it seems that it is only in the past five years that the platform became so big that media agencies began to significantly change. A senior media executive, who asked not to be named, says Facebook's increase in dominance has radically changed the talent pool within media agencies. "You’d go into Zenith or MediaCom and there were three people sitting in the corner of the room, but now there are teams of 30 to 40 people buying Facebook ads all day long. It’s the only thing they do, it seems – it’s mad." Today, about 2.7 billion people are using Facebook, WhatsApp, Instagram or Messenger each month and the company says it has more than seven million advertisers. 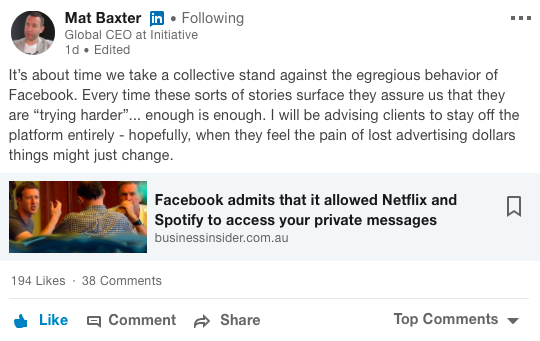 Initiative's global chief executive, Mat Baxter, put his head above the parapet in December 2018 by publicly pledging that he would advise his clients to stay off Facebook "entirely". This was in response to an exposé by The New York Times that revealed Facebook has granted companies such as Netflix and Spotify greater access to its data than previously disclosed. However, Campaign understands that Baxter's post on LinkedIn has not led to any instructions to regional Initiative offices that marketers should be advised to take media off Facebook. Indeed, a source close to the business says that "it's honestly not something that has even come up with our clients… In reality, Facebook is so damn cheap – the volume of impressions is extraordinary and the cost-to-drive effect means it's incredibly good value". However, if brands put all their online spend into just one or two platforms, how can media agencies demonstrate value for clients in the long term? "From a brand perspective, we're here to give competitive adantage, like buying TV 5% cheaper than another agency," the source continues. "But if all spend goes with a monopoly supplier, that's only going to reduce our role as there is less scope for the agency to provide value." Page recalls how Facebook "struck fear" into the hearts of agency networks worldwide "by taking marketers away from the traditional places and [they] did so while offering tools and tips for budding marketers to build their own campaigns without the need for an intermediary". The senior media executive recalls three stages of Facebook’s approach to dealing with UK media agencies. "First, there was this need to embrace agencies in Soho Square – get all over the traditional sales team… then it went sharply to this phase where everything is programmatic and agencies don’t understand us," he says. This is because Facebook offered brands a new way to segment audiences down into niches like never before, while the platform gave advertisers a single place where they knew entire swathes of the population checked in multiple times per day. "Now it looks like we’re at a middle ground where they are working with agencies and there is a common understanding of the challenges they face as a more mature media owner," he adds. "But things could change quickly again, couldn’t they?" Page explains how Facebook has given rise to a new category of marketing collateral: "thumb-stopping content", or ads that compel Facebook users to stop scrolling through an interminable feed of content because something stands out so well. Facebook and other social platforms had given birth to a "quick and dirty" approach to content production. "It was there and then it was gone, so it became about quantity, not quality," she adds. It is also impacting how some agencies are approaching briefs. 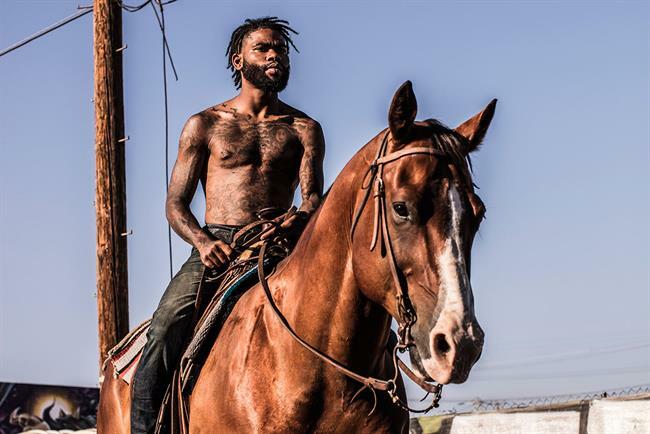 For instance, for 2017's Guinness spot "Compton cowboys", Abbott Mead Vickers BBDO hired a dedicated crew to capture video for vertical formats, separate to the TV shoot. Adam Fulford, Proximity London’s chief strategy officer, points out that Facebook's ascent to adulthood must include a commitment to properly dealing with workplace issues such as sexual harassment claims. He says it took a mass walkout at Google last year before Facebook overhauled its rules around forced abitration of sexual harassment claims. "As recently as December 2017, they were still trying to increase the prominence of their ‘poke’ functionality. A bit like being back in the playground," Fulford says. "As the adolescent matures, we’re fascinated to see how Facebook can (hopefully) become a force for good, particularly in the field of equality." The direct-to-consumer market has been a key part of Facebook's growth story. A brand like Just Eat is a particular success story of a digital brand whose marketing activity began online and then moved to TV and ultimately sponsoring The X Factor. There are now more than 90 million small businesses using Facebook products around the world, including more than four million in the UK, the company says. The senior media executive predicts that all of the new big TV advertisers will be pure-play digital brands that have started their business on search and social: "Look at Thinkbox's top new TV advertisers. Most of them are digital brands such as Deliveroo and Uber." Many brands have embraced chatbots as a relatively cheap and efficient form of customer service, as well as a way of playing with artificial intelligence for brand campaigns. And, just like video and online display, brands take their chatbots to where the audience is: Facebook. Marks & Spencer made its debut on Messenger in December 2017 with the Christmas Concierge Chatbot (created by Grey), which followed Transport for London launching a service-update bot on the platform six months previously. As of June 2018, there were more than 300,000 active chatbots on Messenger, which allows marketers to deliver messaging sequences, create a sales funnel within the program itself and use AI to have automated conversations with customers. Last week, Facebook's northern Europe vice-president, Steve Hatch, was publicly challenged over whether tech companies are contributing enough to the Advertising Standards Authority, given how big they are in proportion to the ad market. In the UK, media companies and brands have always been keen to avoid government censorship and prefer to adhere to a model of self-regulation. But the differece with Facebook is that it markets itself as a data company that does not actively moderate the content that users put on its platform. This can have dire consquences, such as a 14-year-old girl whose suicide was blamed partly on Instagram by her father. Hatch, again in the firing line, apologised and said Instagram does not permit content that glorifies self-harm or suicide. Something has to give: either Facebook accepts that it is a content publisher and is held to the same standards as a newspaper or a TV channel, or lawmakers might finally seek to regulate the company in a way that we've yet to see in the UK. Parliament is set to publish a report later this year that examines whether the internet should be regulated. Facebook is clearly worried about the prospect of greater regulation. Last month, its new global head of communications, former deputy prime minister Nick Clegg, addressed this issue head-on and warned that over-regulating Facebook and other data-driven businesses in the US would risk giving China a global advantage in tech innovation. Clegg is the latest former politician to join the company as a lobbyist, following in the footsteps of his predecessor, Sheffield Hallam MP Richard (Lord) Allan. Last year in the US, it was revealed that Facebook was increasing its lobbying presence in Washington, DC ahead of founder Mark Zuckerberg's appearance before a senate committee, while it spent $3.7m in the second quarter of 2018 alone. And sometimes this went too far: Facebook terminated its contract with Definers Public Affairs last year following reports that it hired opposition research to counter criticism of its role in spreading Russian misinformation and the Cambridge Analytica debacle. Right now, Facebook has more than 2,300 employees in the UK – its biggest engineering hub outside the US. But its London presence is set to get even bigger after it agreed to move into a 6,000-capacity super-office. The new office, planned for 2021, will mean Facebook will be neighbours with Google, which is building its own complex with capacity for 7,000 people. Facebook’s current London headquarters is in Euston and last year it opened a new office in Rathbone Place, near Oxford Street.